How Can Landscaping Make It Easier to Sell Your Home? When you are interested in selling your home, there are a lot of considerations that you will want to keep in mind. You will want to make sure that the home is priced correctly and you will want to make sure that it is appetizing to potential buyers. There are a number of ways to make your house enticing, but one of the more effective options is through maintaining aesthetic landscaping from providers of tree removal and landscaping in Tulsa, Oklahoma. One of the main ways that landscaping and tree services in Broken Arrow, Oklahoma can help your home is through improved aesthetics. When people are looking to purchase a new house, you will want to make sure that your home looks good. If you have an overgrown yard or dead grass, people may feel like the home has not been maintained and it can be difficult to attract potential buyers. You will want to make sure your home looks great, so people will want to see more. Landscaping can also help improve the value of your property. This means, you will not only have an easier time selling your house but you may even get more money out of it. This makes landscaping services a worthwhile investment that can help you expand your wallet. You do not have to go all out and create a landscaping masterpiece. All that’s required is for you to maintain and keep its simplicity, such as removing some trees, having clean cut grass, and making sure everything looks tidy and organized. This can go a long way in attracting potential buyers to your property. 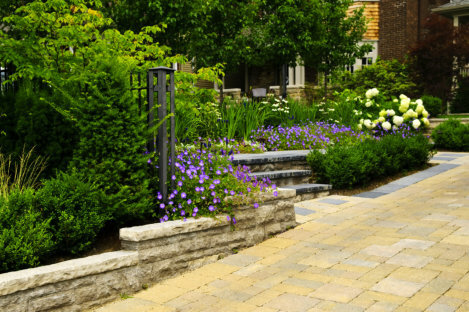 Those are just a few of the many things to keep in mind when it comes down to how landscaping can help you sell your property. If you would like to find out more about landscaping and how it can help you, or about our exceptional tree removal service, please feel free to get in touch with AJ Tree Service for more information anytime. This entry was posted in Landscaping and tagged aesthetic landscaping, attract potential buyers, house enticing, worthwhile investment. Bookmark the permalink.